Despite being of a similar vintage and style (in the broader scheme of things) as Johnny Burnette, this seems completely different. Burnette played rock 'n' roll, inspired rockabilly and probably remains a minority interest. Buddy Holly played pop, inspired The Beatles and is a legend. That's not to say this album is particularly good, sadly. The classics - "Oh Boy", "Not Fade Away", "Maybe Baby" and "That'll Be The Day" - are fantastic, whereas the remainder of the album tracks are filler. In particular, the slower songs on this album drag, which is odd, given that Holly was capable of such gems as "Everyday" or "Words Of Love" (neither of which are on this album). Realistically, this reflects the attitude to albums at the time, a decade away from considering them as worthwhile artistic artifacts in their own right. Why this album then appears in the 1001 Albums You Must Hear Before You Die is a bit of a mystery to me. Buddy Holly - with and without The Crickets - is an artist that really needs a Best Of to appreciate properly. A long time ago I read Charles Shaar Murray's excellent Crosstown Traffic, his biography/cultural analysis of Jimi Hendrix, and this was the first time I really came across Robert Johnson's name. As a black man playing blues-driven rock, Hendrix was obviously influenced by Johnson, and the book goes into some depth about the older man's legend - his original incompetence, his mysterious disappearance for a year, the legendary deal with the devil, his spooky re-emergence as a towering genius and finally his death at the hands of a jilted husband (maybe). And of course, the music - described as a soul-rending cry in the wilderness, an eerie evocation of loneliness, horniness and the personification of the blues. Hendrix - and Clapton, Page, Beck, etc. - probably discovered Robert Johnson in the early sixties on a compilation: The King Of The Delta Blues Singers, issued in 1961, about 25 years after the songs were recorded. But 1961 is 51 years ago. Over fifty years ago. That's a long time and popular music has changed almost beyond recognition, which probably explains this: I don't get it. Whatever it is that the Surrey stockbroker belt guitar heroes heard in these brief, primitive, badly recorded tracks with odd time signatures and uncertain rhythms, it's not audible to me now. They sound far too insubstantial to take the weight of the hyperbole heaped upon them. And surely this is in part due to those very men who were so influenced. I, for one, can't listen to "Cross Road Blues" without hearing Cream's "Crossroads" and thinking how much more energy and power the cover version contains. So it is with these tracks. They were revolutionary; everyone tells me so. Clearly they influenced generations of guitarists. But those influenced have moved guitar playing and guitar music on so far that these tracks sound like they come from the middle of the nineteenth century. Remembering that the recordings are contemporary with such delights of harmonic sophistication as Duke Ellington's "Caravan", Cole Porter's "I've Got You Under My Skin" or Jerome Kern's "The Way You Look Tonight" only serves to make them seem even more dated. 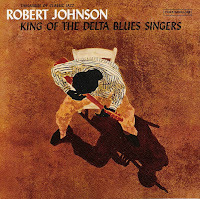 This particular collection, albeit complete (Johnson having only made two recording sessions in his life), has too many alternate takes of interest to obsessives only. In order to pare it down, I listened to the tracks from King Of The Delta Blues Singers, but it only helped marginally. File under "glad I've listened to it but unlikely to bother again". I was lent this book by a colleague and since I've had it for several weeks, I felt I should put some time into it. Not that it takes much time, containing a mere seventy pages. At what point does a pamphlet become a book? Nevertheless, this really is an admirably concise summary of the socialist position: what is wrong with capitalism, why socialism is the answer, why parliamentary socialism has failed and why the Socialist Workers Party has the right solution. Despite the brevity, there is plenty of information packed in and I learned a lot - although possibly this is because I've never looked into socialism before and am therefore deplorably ignorant. The criticisms levelled by Paul Foot at the ineffective, undemocratic and exasperatingly pointless nature of parliamentary politics are not unique to the left wing - they are mirrored remarkably closely (albeit at much greater length) by Jeremy Paxman in his book The Political Animal (2004), which I also happen to be reading. I would venture to suggest that they are shared by most thinking people (where "thinking people" are defined as anyone who shares this view, obviously). What differs is the opinion of the cause of these shortcomings. Foot - and socialists generally, I assume, from my limited exposure - believe that our current political system has been deliberately created by the "ruling class" to quash dissension, divert debate and create an illusion of democracy, all the while reinforcing the grip this ruling class has on power, property and money. He sees nothing less than a conspiracy to con the working class out of the fruits of their labours. I'm not convinced. For this to be true would require an astonishing amount of intelligence, forward planning, understanding of human nature, and a supernatural ability to predict the future. The world and its environments - natural, economic, political, you name it - is insanely complex. It is a chaotic system, in the same way as the weather is. Even though it is deterministic, it is fundamentally unpredictable. Therefore, any attempt to consciously control it - either by some secret cadre or by a socialist planned economy - is doomed to failure. The evidence of this is all around us at the moment. It's easy to look back with hindsight and see a pattern. Foot provides us with evidence (albeit with no citations at all, which dents his credibility somewhat) of ways in which things are getting worse. And you know what? I agree with him. There clearly is too much power in the hands of multi-national corporations and their bosses and the trend is not for this to be reduced. But to ascribe this to anything other than sociological drift is to credit too many people with too much intelligence. I subscribe heartily to two maxims - I might even call them axioms - of human nature. The first is known as Hanlon's Razor: "Never attribute to malice that which is adequately explained by stupidity." The second is from Hollywood screenwriter William Goldman's fantastic book Adventures In The Screen Trade: "Nobody knows anything". (Goldman is explaining why you should be wary of anyone claiming to know what will produce a hit movie, but it applies universally.) People are stupid and ignorant. They are stupid in a myriad of complicated, clever, selfless ways and ignorant in another multitude of well informed, well researched and clever ways. So, although I broadly agree with his analysis of what is happening, I don't agree with his claim for its cause. What about his contention - the point of the book - that the answer is socialism? Well, you won't be surprised to hear that I don't agree with that either. Socialism seems to me to have a central paradox at its core. If you believe that the reason we are in our current mess is because humans are selfish, greedy and lazy, then how can you simultaneously believe that making everyone decide things together will magically cure this? It doesn't matter how much you try and demonize the "ruling class", they're still human. They behave the way they do not to protect their class but to protect themselves, individually, because that's human nature. Socialists believe that somehow they can square this particular circle. Foot only alludes to it in this book but I'm sure there are lots of very detailed plans for making it work. But the key word here is "believe". You can't know this will work, only believe, because you can't prove anything. It's a cult, like any religion, like believing in aliens or that the Apollo moon landing was faked. Any evidence - however small - in favour of their pet theory is grasped wildly and trumpeted out of proportion to its significance. Any evidence against their beliefs is dismissed for any number of reasons, or even claimed to be further evidence of a conspiracy. Worldwide, no society has successfully implemented socialism and many have provided gruesome evidence of how it would fail. Foot spends some time explaining that the former USSR or modern day China are not socialist states, but neglects to explain why they stopped being socialist. I'm sure there are many worthy theories for this that conveniently attribute the causes anywhere but at socialism itself, but surely one of the most basic requirements of any system is stability. If it can destabilised by rogue individuals, it's not actually much good, is it? Socialists are probably fed up of critics waving Orwell's Animal Farm in their faces, but I can't really put my critique any better. Socialism isn't "self-government" because there's no such thing in any society of more than about fifty people. Someone is doing more of the governing than someone else - even if they're only "facilitating" decisions, choosing what information to publish to support that decision, or choosing how to implement a decision. How long before this person chooses to implement a decision in a way that suits them personally more than it suits someone else - even unconsciously? "The major problem - one of the major problems, for there are several - one of the many major problems with governing people is that of whom you get to do it; or rather of who manages to get people to let them do it to them. "To summarize: it is a well known fact that those people who most want to rule people are, ipso facto, those least suited to do it. "To summarize the summary: anyone who is capable of getting themselves made President should on no account be allowed to do the job. "To summarize the summary of the summary: people are a problem." I don't have an answer. I don't think there is an answer. And I'm very suspicious of people who claim to have an answer or (worse) know the answer. If there's one thing I would change about our current political culture, it's the way that uncertainty is seen as weakness. "The fundamental cause of the trouble is that in the modern world the stupid are cocksure while the intelligent are full of doubt." One can only respect the dedication that people like Paul Foot have, but I can't help but regard it as misguided.